Now that we’ve reached June, life at UW-Madison has shifted to a calmer, more relaxed pace. Buildings are less crowded. There are not as many meetings and no more classes, homework, or exams. The end-of-semester crunch is not a phenomenon unique to students, however. The end of April and beginning of May are also peak corn planting time in the Wisconsin area. Long-term studies done by researchers at the Arlington Agricultural Research Station have shown that the year-to-year average planting date that produces the highest corn yield is April 28th, with potential losses due to planting either too soon or too late. However, the best date to plant changes every year and depends on weather conditions—cool, wet periods will delay planting, while warm, dry conditions will help farmers get out in the fields earlier. WSC’s field scientists pay very close attention to how corn planting is progressing around the Yahara Watershed. For our research on the impacts of shallow groundwater on corn production, we have several field sites in northern Dane County where we have been tracking groundwater levels and soil moisture throughout the corn growing season since 2012. However, because our sensors are scattered throughout the field, we have to remove them every fall so they won’t get destroyed during harvest, and we can’t put them back in the ground until planting is complete. 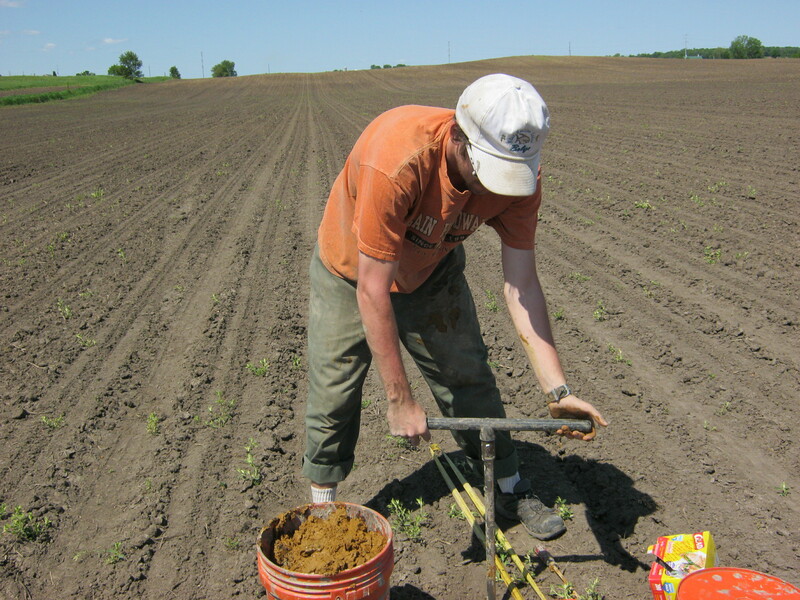 So, once our field sites get planted, we begin the mad rush of digging holes as fast as we can. This allows us to monitor critical early season groundwater levels, when the smaller plants are most vulnerable to flooding and overly wet soil conditions–early season soil is often the wettest and most flood-prone, due to snowmelt and spring rains. And, because we don’t want to compact the soil and harm the corn, we have to dig all our holes by hand! 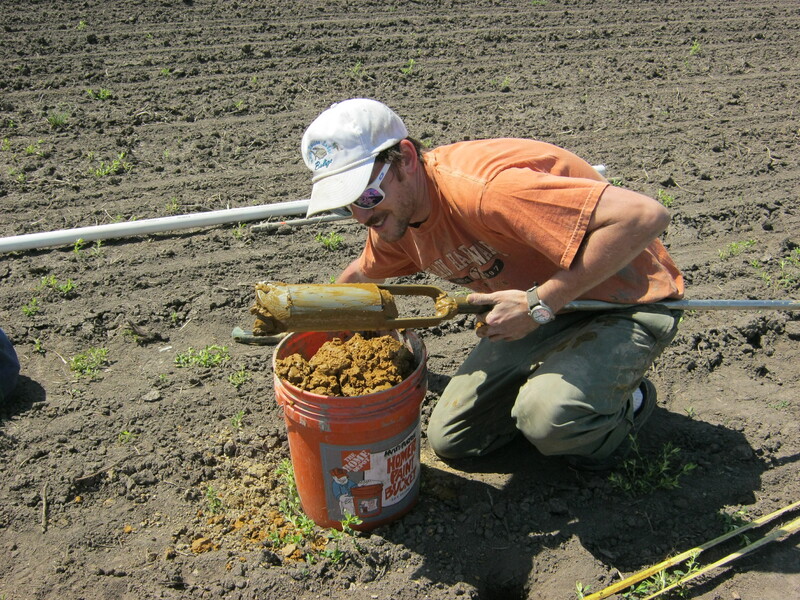 WSC researcher Sam Zipper digs a hole to plant a sensor. Digging wells usually takes the first few weeks of our summer field season. By the time you’re reading this, we should have all our instruments in for 2014. While hand-installing so many wells can be a tedious and frustrating process at times (our bucket auger gets stopped by any rocks that are egg-sized or larger; in glacial landscapes, such as Wisconsin, these are almost everywhere), it gives our field crew a chance to investigate what different soil types are present throughout the entire corn root zone. This information is necessary to make sure our biophysical models are accurately simulating water flow through the root zone and down to the water table. A famous saying by H.H. Read is, “The best geologist is the one who has seen the most rocks.” Well, in our case, the scientist who has the best understanding of how water and corn interact is the one who has dug the most holes! Zipper investigates a soil sample. This entry was posted in Groundwater and Agriculture and tagged Arlington Agricultural Research Station, corn production, groundwater, Sam Zipper. Bookmark the permalink.